It's a very rainy Friday here in Toronto. No reason to be blue though, as I've finished 8 final sized tea towels! I am definitely going to have to come up with a quicker way to make the towels and a cheaper online wholesaler, but I'm happy with the final product. I have already changed the colour plan slightly. I won't be using the dark teal colour as a fabric base for the "Tin" towel set. It gave me an icky feeling when I was doing the mock up, and from what I can tell, others feel the same way. I'm going to make them orange, I think. Or white. Anyhow, the teal is OUT. I've been working on the screened design for the towels too. 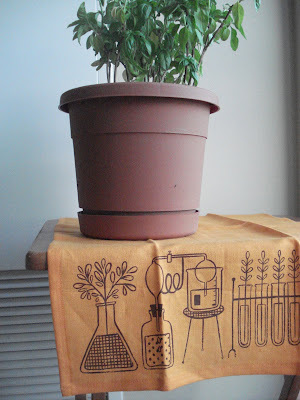 Sunday is the big day- the silk screen workshop! I want to make sure I'm as ready as can be so I can make the most out of it. I am really pumped! After this weekend I'm going to make up the corresponding embroidered towels to make the five final mock up sets. I've also got to get going on an illustration for a show I'm going to be in coming up at the beginning of November. More on that as it comes closer. Tomorrow night is this crazy art event in Toronto- Nuit Blanche. It starts at 6:59 pm and finishes at 7 am on Sunday morning and happens all over the city with exciting displays, installations and general artiness! As a "roving reporter" for Claire Loves... I will be filling you in on all the fun on my Monday blog entry. Before I sign off to go to a Madonna tribute dance party (yes, you heard me right) I want to let you know that there is a new little addition to the animal gang at the Toronto zoo. 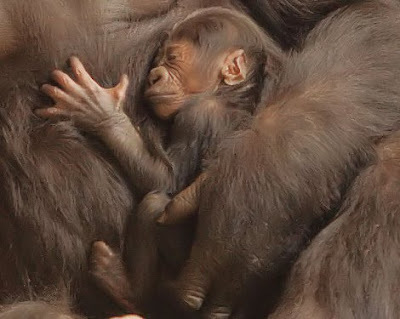 It's a newborn gorilla and you have a chance to him! I actually suggested my ultimate cat name, Bruce, as I feel it transcends species. If you have a chance, drop by the Toronto Zoo website and make a difference in the life of a local gorilla. Time to make like Madge and vogue!